You haven't given enough information to calculate subnets for this network; as a general rule you build subnets by reallocating some of the host bits as network bits for each subnet. Many times there isn't one right way to subnet a block... depending on your constraints, there could be several valid ways to subnet a block of addresses. Since IPv4 addresses are 32 bits wide, and we are using the host bits (i.e. least significant bits), simply subtract 7 from 32 to calculate the minimum subnet prefix for each subnet... 32 - 7 = 25. Since we only want four subnets from the whole 128.42.0.0/21 block, we could use /23 subnets. I chose /23 because we need 4 subnets... i.e. an extra two bits added to the netmask. This is what we've already done above... just reuse the host mask from the work we did when we calculated the broadcast address of 128.42.5.4/21... This time I'll use 1s instead of h, because we need to perform a logical AND on the network address again. NOTE: If you try starting from the right-hand side, don't get tricked just because you find one matching column of bits; there could be unmatched bits beyond those matching bits. Honestly, the safest thing to do is to start from the left-hand side. Admins, if this post is considered spam, please feel free to delete it. Edit: As per YLearn's suggestion, I'll try to grab the relevant parts from Part 1 of my series, without pasting the whole entry here. Let's use 195.70.16.159/30 as an example. I do not want to take anything away from Mike Pennington's excellent answer, which I have relentlessly promoted, but I keep seeing questions that are not directly addressed by his answer, and I have created something that was originally based on Mike's answer, but I have more information to address questions that have popped up over time. Unfortunately, it is too large, and I had to break it into two answers. Given an IPv4 address and the IPv4 network mask (the network mask can also be derived from a network mask length or host mask), you can determine much information about an IPv4 network: Network Address, Network Broadcast Address, Total Host Addresses, Total Usable Host Addresses, First Usable Host Address, and Last Usable Host Address. I cannot stress enough that you must do IPv4 math in binary. I think every network engineer (or would-be network engineer) has tried to figure out a way to do it all in decimal, as I’m sure you will*. The problem is that 10 (decimal) is not a power of 2 (binary), so decimal and binary do not naturally convert between each other the way that hexadecimal (base 16) naturally converts to and from binary because 16 is a power of 2. It seems that using dotted-decimal notation for IPv4 was an early mistake that cannot now be corrected, but IPv6 adopted the use of hexadecimal from the very beginning, and it is easy to convert between hexadecimal and binary. Where decimal is all about the powers of 10, binary is all about the powers of 2. 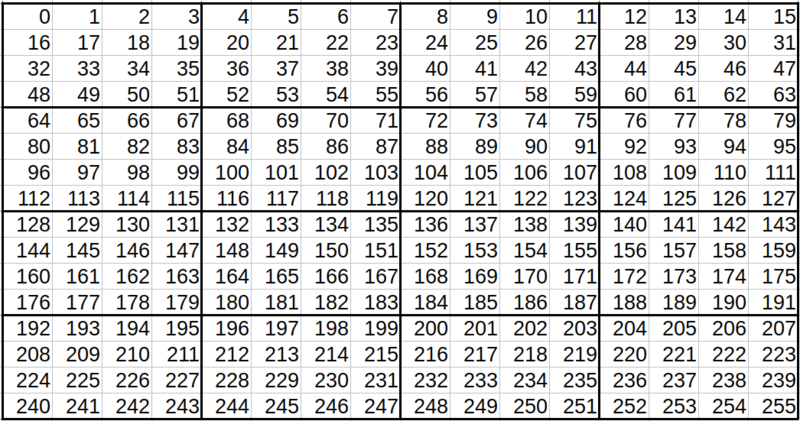 Notice that for each bit number in the table above, the corresponding value is 2 to the power of the bit number. *If you perform IPv4 math for many years, you may get to the point where you can perform binary/decimal conversions in your head, and you can then appear to be able to do IPv4 math in decimal. Even though I can do this in my head, I will always double-check with an IP calculator, or convert to binary, perform the math, and convert back to decimal, before committing a change to a production network. The IPv4 dotted-decimal notation, e.g. 198.51.100.223, is simply to make it easier for humans to read an IPv4 address. The four separate sections, called octets, really have no meaning to IPv4. Do not make the common mistake of thinking the octets have a special meaning. An IPv4 address is really a 32-bit binary number, and that is how network devices see and use an IPv4 address. Because each octet is eight bits in length, each octet will have a value between 0 and 255 (any values greater than 255 are invalid). The reason is that 2^8 = 256: 2 (the binary number base) to the power of 8 (eight bits per octet) equals 256, the number of different values that can be expressed by an eight-bit octet. Remember that the first value is 0, so the 256th value will be one less that the total number of values that can be expressed (256 – 1 = 255). *Leading zeroes in a dotted-decimal IPv4 address may be interpreted by some applications and programming languages as octal (base 8) rather than decimal (base 10), causing errors, and leading zeros should be avoided for the dotted-decimal IPv4 representation, but leading zeroes are necessary for the binary IPv4 address octets because they represent bit positions in the full address, and leaving out a bit position will shorten the address and change the binary value. An IPv4 network mask is used to divide an IPv4 address into two parts: the network part, and the host part. The division can be at any bit number, so it may fall within an octet, not on an octet boundary, as many people incorrectly assume it always does. An IPv4 network mask is the same size as an IPv4 address (32 bits), and it is expressed in dotted-decimal notation the same way you would express an IPv4 address in dotted-decimal notation (four eight-bit octets, separated by a period). For example, 255.255.248.0. As you can see, the division between the network and host portions of the IPv4 address using this particular mask falls within an octet, not on an octet boundary. An IPv4 network mask is often represented by the number of consecutive 1 bits in the mask. This is variously called the network mask length or prefix length, and it is represented as a / followed by the number of consecutive 1 bits in the network mask. For our example, counting the number of consecutive 1 bits gets 21, which can be represented as /21. The example may be represented traditionally as 198.51.100.223, with a network mask of 255.255.248.0, or it may be represented as the more modern CIDR (Classless Inter-Domain Routing) 198.51.100.223/21. An IPv4 network address is an IPv4 address with all the host bits set to 0. The IPv4 network address can be calculated by a bitwise AND of the respective bits in the binary representation of the IPv4 address and the IPv4 network mask. Align the bits in both addresses, and perform a bitwise AND on each pair of the respective bits, then convert the individual octets of the result back to decimal. As you can see, the network address of 198.51.100.223/21 is 198.51.96.0. Notice that You cannot depend on the octets to tell you which portion of the address is the network, and which portion of the address is for the hosts. Compare the resulting IPv4 network address to the original IPv4 network address, and notice that the network addresses are equal, so the host addresses are on the same network. Compare the resulting IPv4 network address to the original IPv4 network address, and notice that the network addresses are different, so the host addresses are on different networks. *This is the method a source host uses to determine if it a destination host on the same network as the source host. It is possible to mathematically create a host mask from the network mask, or the network mask from the host mask by subtracting the starting mask from the longest mask (/32, or all-ones mask). An IPv4 network broadcast address is the IPv4 network address with all the host bits set to 1. There are several ways to calculate the IPv4 network broadcast address. For our example IPv4 address 198.51.100.223 and network mask 255.255.248.0. The total number of IPv4 host addresses for a network is 2 to the power of the number of host bits, which is 32 minus the number of network bits. For our example of a /21 (network mask 255.255.248.0) network, there are 11 host bits (32 address bits – 21 network bits = 11 host bits). That means there are 2048 total host addresses in a /21 IPv4 network (2^11 = 2048). Except for /31 (network mask 255.255.255.254) and /32 (network mask 255.255.255.255) networks, the number of usable host addresses on an IPv4 network is the total number of network host addresses minus 2 (because the IPv4 network and broadcast addresses are unusable for host addresses on the network, you must subtract them from the number of usable host addresses). For our example of a /21 (255.255.248.0) network, there are 2046 usable host addresses (2^11 - 2 = 2046). The above hints do not apply to /31 (network mask 255.255.255.254) or /32 (network mask 255.255.255.255) networks. Given enough time on your exam, and a problem that has multiple methods to arrive at an answer, you should use the multiple methods to double-check the answer. A gateway is a host on the network that knows how to forward packets to other networks, and it can be assigned any usable network host address. Some people just randomly assign gateway addresses to any usable network host address, some people always assign the first usable network host address to a gateway, and some people always assign the last usable network host address to a gateway. It doesn’t actually matter which usable host network address you assign to a gateway, but you should try to be consistent. Originally, /31 (network mask 255.255.255.254) networks were unusable because there is only one host bit, giving you two total network host addresses, but the number of usable network host addresses is the total number of network host addresses minus 2 (2 total host addresses - 2 = 0 usable host addresses). Point-to-point links only need two host addresses (one for each end of the link). The traditional way of assigning IPv4 networks required the use of /30 (network mask 255.255.255.252) networks for point-to-point links, but that wastes half the network host addresses because a /30 network has four total network host addresses, but only two are usable network host addresses (2^2 – 2 = 2). With the critical IPv4 address shortage, a standard was created to allow the use of /31 networks for point-to-point links. That makes sense because there is no need for broadcast on such networks: any packets sent by a host on the network are destined for the only other host on the network, effectively broadcasting. On a /31 network, the network address is the first usable host address, and the broadcast address is the last usable host address. Unfortunately, not all vendors (Microsoft in particular) support the standard for using /31 networks on point-to-point links, and you will most often see point-to-point links using /30 networks. A /32 (network mask 255.255.255.255) network is both a network with no host addresses, and a host address, itself. There is only one address in the network, and that is the network address. Because there are no other hosts are on the network, traffic must be routed to and from the network address. These addresses are often used on virtual network interfaces defined inside a device that can route packets between its virtual and physical interfaces. An example of this is to create a virtual interface in a network device to be used as the source or destination for the device itself. A virtual interface cannot drop because of a physical problem, e.g. cable unplugged, and if the device has multiple paths into it, other devices can still communicate with the device using the virtual interface address when a physical interface of the device is inoperable for some reason. *There is a persistent myth that for subnets, as for host addresses, the all-zeros and all-ones subnets cannot be used, but this myth was explicitly dispelled many years ago by a standard. Unfortunately, this myth extends to some network educations classes, and the correct answer for those (incorrect) classes would be to use the 2nd through 15th subnets. It is possible to subnet a network into variously sized subnets (every IPv4 network is a subnet of the 0.0.0.0/0 network address), as in our example above, where the unused subnet is a /24 subnet, but this requires careful planning so that the resulting subnets start on the correct bit. For example, let’s say that we need both a /26 and a /27 subnet from our 198.51.96.0/21 network. There are two ways to do that: start with the /26 subnet, or start with the /27 subnet. Notice that we are actually subnetting the second /26 subnet into a /27 subnet, and that works well because 27 is larger than 26. A /26 subnet must always start on a /26 boundary: every 2nd /27 subnet boundary, every 4th /28 boundary, every 8th /29 boundary, etc. This rule is for any subnet size: a subnet must start on a boundary of a longer subnet that is equal to 2 to the power of the longer subnet size minus the subnet size. For example, a /23 subnet must start on every 4th /25 network (2^(25 - 23) = 2^2 = 4). Trying to configure a device with a network address that starts on the wrong bit boundary will either lead to strange, hard to troubleshoot problems, or the device will give you an error about overlapping networks. Some people try to do this with dotted-decimal, and this can lead to errors. For example, the 198.51.96.0/27 network host addresses are 198.51.96.0 through 198.51.96.31. If you know that and try to use the 198.51.96.32/26 network, you will run into problems because that network starts on the wrong bit boundary and overlaps the /27 network (check by using a bitwise AND with the addresses and the network masks). It is obvious in binary, but it is not so obvious in dotted-decimal. You can learn that /26 networks must start on a multiple of decimal 64 boundary, but seeing it in binary can tell you for sure whether or not you have made a mistake. *There is a persistent myth that for subnets, as for host addresses, the all-zeros and all-ones subnets cannot be used, but this myth was explicitly dispelled many years ago by a standard. Unfortunately, this myth extends to some network educations classes, and the correct answer for those (incorrect) classes would be to use the 24th (23 decimal, 10111 binary) subnet in our example of equal-sized subnets, rather than the actual 23rd (22 decimal, 10110 binary) subnet. You may be given two (or more) different host addresses and asked to come up with the largest network (smallest number of hosts) that contains both host addresses. For example, find the largest common network of 198.51.100.223 and 198.51.101.76. Count the number of matching bits, 23 in this case, to get the mask length. You can then take either address and perform a bitwise AND with the network mask to get the common network. Doing this on both addresses should result in the same network, and if it does not, then you either miscounted, or you missed an unmatched bit position. Notice that the two network addresses match. That means the largest common network for the two host addresses is 198.51.100.0/23 (CIDR notation), or (traditional) 198.51.100.0 with a mask of 255.255.254.0. *You may see this called the smallest common network (or some variant, e.g. minimum network or mask). The smallest network is actually 0.0.0.0/0 (0 network bits), and it is the common network for all IPv4 addresses, so it is the smallest common network between any IPv4 addresses. The confusion arises because many people look at the host portion of the address and see its size as the network size, rather than the size of the network portion of the address. IPv4, itself, does not have the concept of, nor distinction between, public and private addressing. The IPv4 Private addressing was arbitrarily chosen, and the ISPs, by agreement, will not forward packets on the public Internet using addresses in the Private address space, but network devices and hosts have no idea if an address is public or private. 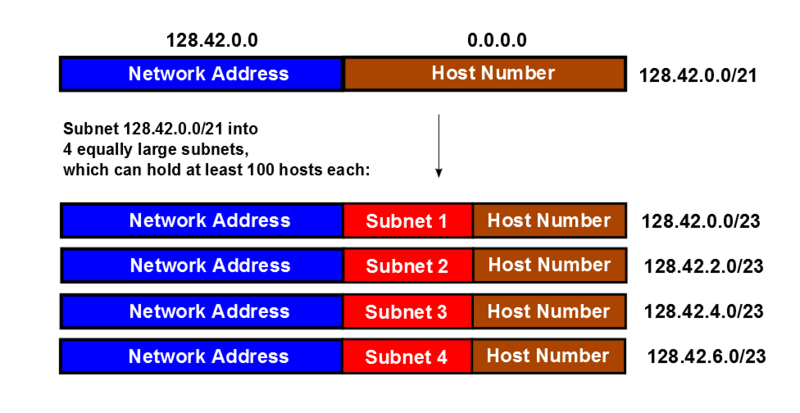 Originally, IPv4 addresses were divided into network classes. Classful addressing was deprecated decades ago, and modern networking is based on CIDR (Classless Inter-Domain Routing), but, unfortunately, many network education classes and certification exams insist on testing your knowledge of classful addressing. Please learn and be comfortable with all the previous IPv4 math in this document before you learn about classful addressing. Class A networks have a default network mask of 255.0.0.0 (/8), and a default host mask of 0.255.255.255, giving you 16,777,216 total host addresses per network. Class B networks have a default network mask of 255.255.0.0 (/16), and a default host mask of 0.0.255.255, giving you 65,536 total host addresses per network. Class C networks have a default network mask of 255.255.255.0 (/24), and a default host mask of 0.0.0.255, giving you 256 total host addresses per network. Class D addresses are used for multicast, where each address is used individually to represent a group of hosts that subscribe to a multicast address. That means that Class D addresses do not normally have the concept of a network mask. Class E addresses are reserved, and they cannot be used for anything. There is one exception to this, and that is the Limited Broadcast address of 255.255.255.255, which is an individual address that every host on a network will treat as its own. That means that anything sent to 255.255.255.255 will be received and processed by every host on the network. Notice that the first three address bits are 110, meaning that this is a Class C address, and absent any mask or mask length, the network mask is assumed to be 255.255.255.0 (/24), making the network address 198.51.100.0. *Do not make the common mistake of thinking the network mask dictates the network class, it is the other way around. For example, many people consider any /24 network to be a Class C network, but that is not even remotely true. Given, for example, a 10.11.12.0/24 network, many people incorrectly call that a Class C network because of the network mask, even though the first bit of the address is 0, making it is a Class A network, albeit with a longer network mask than the default Class A network mask, meaning it is a subnet of a Class A network, not a Class C network. This is for the common question "How do I cut a given network size into n pieces allowing for x1 hosts in network 1, x2 hosts in network 2, etc ...?" can absolutely be solved by working through the methods described in the other excellent answers. Some people however, might like a more visual method and some general tips. 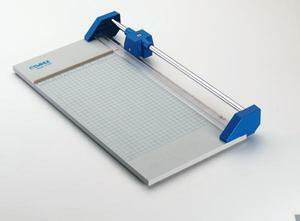 The properties of this kind of cutter are that it only cuts straight lines, it always cuts all the way across the paper, and it cuts perpendicular to a side. Our particular guillotine is fussy: it will only cut paper in half, and we can't make any cut closer than 1 cm from the edge. How many addresses are available in total for your starting block? Here's an illustration of the process. 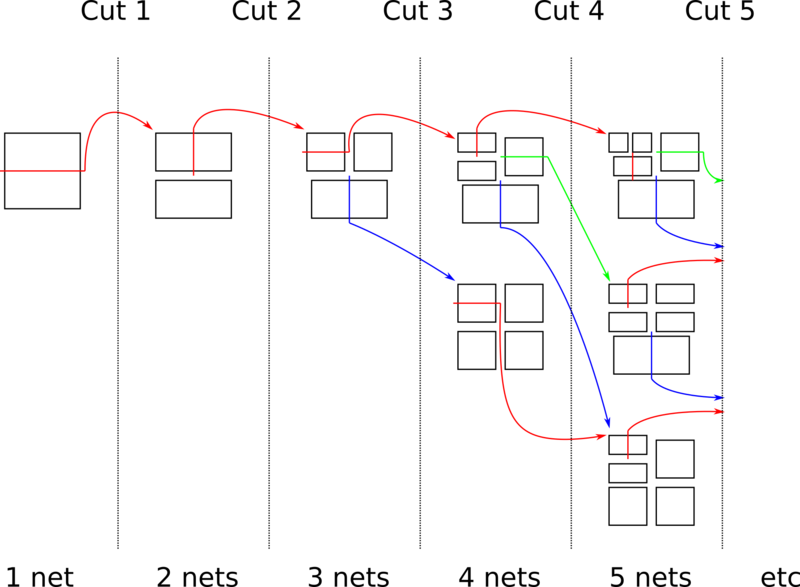 You see that there is only one kind of cut possible at cut 1 and cut 2, but at cut 3 we make a choice: cut the small piece (red) or the big piece (blue), giving two different possibilities. The is what's often called the guillotine problem, which I learned as the "glasscutter" problem, as sheet glass really does has to be cut all the way across, and this specific might be called "binary glasscutter" as it's always cutting into halves. When I actually do this in real life, I mentally do the halvings while looking at grid like this. I can remember that /26 must begin on 0, .64, 128 or .192; I might know that the seventh leased line needs the seventh /30 in the top quarter, but I won't remember that's .216. The grid obviously can be used to represent the third octet too, and each square represents a /24. Now it says that a /18 begins on .0, .64, .128 or .192. Not the answer you're looking for? Browse other questions tagged ip ipv4 subnet ip-address or ask your own question. Which CIDR block contains the most IP addresses, 192.168.0.0/16 or 169.254.0.0/16? how to find a minimum number of host bits needed? How is the IP prefix passed to the router? How can calculate IP address when subnet number is different? Can I always separate two IP addressess into two subnetworks? Am I allowed to change the network bits in a class C subnet mask? Can I subnet a host coming from a network address? Finding the network address for given host IP?